Posted in Books, Memoir, Pioneers. Some stories stick in your mind. These forty-five are favorites of author/editor Carolyn Wing Greenlee who tells why she remembered them and the often surprising circumstances that led to their publication. 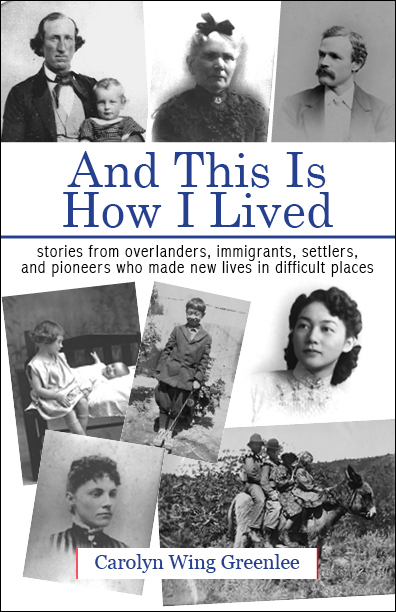 Among them are eye-witnesses who take you on the Oregon/California trail, inside a Chinese laundry, into a Victorian family living near a quicksilver mine, visiting lonely Chinese railroad workers, and into the lives of those who settled where mountains still bear their names. Here are accounts of ordinary people making their homes in unfamiliar places. Often they were adults recounting experiences they had as children. What did they choose to remember? What did they choose to tell?